A spectacular northern lights display and planetary lineup converged this past weekend, creating an unforgettable night sky show for some lucky stargazers around the world. The dazzling night sky double play combined bright auroras powered up by a recent solar storm with a magnificent conjunction of the planets Venus and Jupiter with the crescent moon early Sunday (July 15). 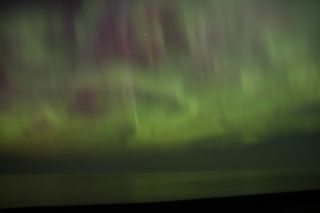 The northern lights show was sparked by a powerful July 12 solar flare that, as an X1.4-class event, marked one of the strongest sun storms of the year. X-class solar flares are the most powerful types of flares from the sun, and Thursday's storm was the second such eruption in less than a week. Rossi's photos show spectacular green and red northern lights shimmering in a starry sky. In some images, bright violet hues are visible. "It was almost 3:15 a.m. and I stepped outside to see what was happening again and couldn't believe what I saw in my backyard," Rossi said. "The lights were almost vertical." By coincidence, the weekend northern lights show occurred on the 12th anniversary of a major solar flare that occurred on Bastille Day, July 14, 2000. On that day, the sun unleashed an X5-class solar flare, a sun storm much more powerful than Thursday's event, NASA scientists said. In Wisconsin, night sky photographer Sean Lenz of La Valle wasn't expecting to see auroras, but was ecstatic when he captured them on camera. "I was taking long exposures of the night sky after my friend told me to be on the lookout due to the recent solar activity," Lenz wrote in an email. "After some time, we noticed a strong green color over the tree line. I never thought I would see the northern lights so well in Wisconsin." Some experienced photographers had a bit of fun with their northern lights photos. At Lake Chelan, Wash., veteran astrophotographer Sy Stepanov ran across a field while spinning a flashlight to decorate an aurora photo with bright arcs of artificial light. In Canada, ice road bridge inspector Travis Costello sent SPACE.com pictures of the northern lights from northern Manitoba, where he inspects a temporary ice bridge currently under construction. The last two X-class solar flares have triggered aurora light shows so bright that, at times, they cast wispy shadows on the ground, Costello said. "I have always wanted to capture northern lights on my camera and it seems this year my stars were aligned to do so," Costello wrote in an email. "I am very pleased that I am seeing blues, violets and pinks along with the glowing greens up here. It makes it very worthwhile to leave home and my friends for weeks at a time." Veteran night sky photographer Giuseppe Petricca of Pisa, Italy, snapped this stunning view of the crescent moon, Jupiter and Jupiter's moons during a July 15, 2012 occultation. For some observers, the pinnacle of the planetary spectacle came as Jupiter appeared to pass behind the edge of the moon in what scientists call an "occultation." Jupiter, the largest planet in the solar system, and its own moons were clearly visible in photos of the event sent to SPACE.com. Night sky watcher Julie Zaloga caught Jupiter, Venus, Aldebaran and the moon over Sacred Valley, Cuzco, Peru, on July 15, 2012. "It was amazing to observe the biggest planet of the solar system going behind our natural satellite!" exclaimed veteran night sky photographer Giuseppe Petricca, who watched the event from Pisa, Italy. "The emerging phase was even more beautiful, firstly with the small satellites and then the planet coming out behind the 'earthshined' portion of the moon. Then Venus concluded the show!" Earthshine is a term that refers to the ghostly glow of the darkened portion of the crescent moon when it is illuminated by sunlight reflected from Earth. Venus and Jupiter are offering a steady pre-dawn spectacle for early risers in July. For the July 15 conjunction, the online skywatching service Slooh Space Camera offered remote telescope views of the moon and planets for diehard sky observers who missed the planetary display due to bad weather. But Jupiter and Venus aren't the only planets visible in the night sky this month. Mars and Saturn are putting on their own display in the western sky during the late evening. On Tuesday night (July 17), Saturn and Mars will form a triangle with the bright star Spica. The trio will be visible above and to the left of the constellation Leo at about 9 p.m. local time, weather permitting. Saturn, Mars and Spica will gradually near one another until mid-August, when the three bright objects will form a nearly straight line on Aug. 14. The crescent moon will join the group later in August to add to the sky show. Editor's note: If you snap any amazing photos of the northern lights or bright planets in the night sky that you'd like to share for a story or gallery, please send images and comments to SPACE.com managing editor Tariq Malik at tmalik@space.com.